Here is the newly revealed PS3 straight from E3. Here are some specs and a photo! * The nVidia graphics will be called the RSX (âReality Synthesizerâ), and will trump the Xbox 360 with 1080p (yes, thatâs a p) graphics support. 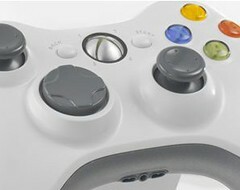 This is the new XBOX 360's controller that has built in wireless, and a stange button in the middle (that also happens to be the logo for the XBOX 360). 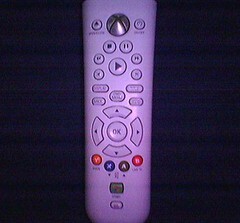 Here is a pciture of the XBOX 360 Media Remote control taken by a camera phone at the Los Angelos unveiling party. 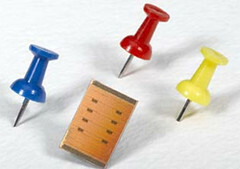 This is a picture of the Cell Processor that is going to be used in the new Playstation 3. 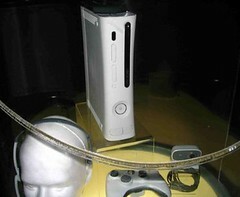 There is news that the UK version of the Xbox 360 will be released sometime in October/November. The U.S version will be released a few weeks before the UK version. So we can hopefully expect the Xbox 360 in October or November (of this year, lol). According to BBC, the new PS3 will most likely not be released until early 2006 even thought they will be demoing their new console at the upcoming E3. The new console will feature the new Cell processor (see next post for details). Both Sony and Microsoft are differing in the format that they are using for their new consoles. Sony has said that they are using the new Blu-Ray format. While Microsoft has said that they are supporting the new HD-DVD format. The word on the street is that the new Microsoft Xbox wil be called the Xbox 360. Until this is confirmed this is still just a rumor, but some sources have said that they have worked on the porject and seen the packaging and demos. The reason for this name change (the next Xbox was rumored to be called the Xbox 2 or Xbox Next) is that Microsoft felt that witha name such as Xbox 2, people might think it technologicaly inferior to the Playstation 3. Sony's new PSP (Playstation Portable) will be released March 24, 2005 with a retail price of 249.99. The PSP wil come with a "value pack" that inclueds a 32mb memory stick, headphones (w/remote), battery pack, AC adaptor, soft case, cleaning cloth & UMD multimedia sampler. Sony also said that there will be about 24 games released at the same time.